Meniscus Tears, Knee Ligament Tears (ACL, LCL, MCL) and IT Band Syndrome are just some of the common knee injuries and conditions that athletes face. While there are many treatment options out there, one of the easiest things you can do is to tape your knee. Before you go for a run or play a game of football, tape your knee up to prevent strain and aggravation of the soft tissue. If you are already injured, taping can help to prevent further damage. There are a variety of taping applications below that provide your muscles, tendons and ligaments with the additional support and protection they need. Take a full length piece of tape (about 10 inches long) and cut it in half, rounding the corners, so you have two pieces that are each about 5 inches long. Bend your knee so it's at a 90° angle and take one of the 5 inch strips, tearing the backing in the middle and peeling it away so you are holding onto the two anchor ends. Apply the strip vertically over the point of pain on the inside of your knee (so it's parallel with your thigh) , using 80% stretch in the middle and no stretch at the ends. Apply the strip horizontally over the point of pain (so it's parallel with your calf) to form a "cross" shape, using 80% stretch in the middle and no stretch at the ends. Take a full length piece of tape and tear the backing off one end, anchoring it between the place where the other two pieces were anchored, using no stretch. Using 25% stretch, follow the line of your knee through the center of the "cross", curving along the shape of your knee and up your thigh. Lay down the end with no stretch and rub the tape in to ensure sticking. Apply the strip horizontally just below your kneecap, using 80% stretch in the middle and no stretch at the ends. Apply the strip horizontally just below your kneecap, directly over top of the piece you already applied, using 80% stretch in the middle and no stretch at the ends. Take a full length piece of tape and measure it from the right side of your kneecap up to your thigh. Tear the backing off the end at your thigh and anchor it on your quad muscle, using no stretch. Using 25% stretch, pull the tape down along the outside of your kneecap. Once the tape is even with your knee, use 50% stretch and let the tape follow the bottom of your kneecap, around to the opposite side of your knee, laying down the end with no stretch. Use the technique in Steps 6-9 for the left side of your knee. Lay down on your uninjured side and flex your injured knee to 60°. Using no stretch, anchor the end of the tape several inches above your point of pain. Pull the tape down around the shape of your knee using no stretch. Take another full length strip of tape and cut it in half, rounding the corners, so you have two pieces that are each about 5 inches long. Using 100% stretch in the middle and no stretch at the ends, apply the strip horizontally over your point of pain. Using 100% stretch in the middle and no stretch at the ends, apply the strip vertically over your point of pain to form a "cross" with the other half piece of tape. Take one full length strip of tape (about 10 inches long) and tear the backing in the middle, peeling it away so you are holding onto the two anchor ends. Sit down on a flat surface with your knee stretched out straight in front of you. 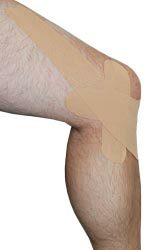 Using 100% stretch, apply the middle portion of the tape horizontally below the bottom of your kneecap. Lay down each end of the tape with no stretch. Position your knee at a 90° angle. Take one full length strip of tape (about 10 inches long) and tear the backing off one end. Anchor the tape just below your kneecap and use 10% stretch to pull it up and around the outline of your kneecap and up your thigh. Lay the end of the tape down with no stretch. Take another full length strip of tape and tear the backing off one end. Anchor this piece on the opposite side, just below the bottom of your kneecap. Using 10% stretch, pull the tape up and around the opposite side of your kneecap and up your thigh. Using 100% stretch in the middle and no stretch at the ends, apply the tape just below the bottom of your kneecap, directly over where the first two pieces were anchored. Position your knee at 90°. Take a half piece of tape (5 inches) and tear the backing in the middle, peeling it away so you are holding onto the two anchor ends. Using 100% stretch in the middle and no stretch at the ends, apply the tape horizontally over the point of pain on the outside of your knee. Take another 5 inch piece of tape and tear the backing in the middle, peeling it away so you are holding onto the two anchor ends. Using 80% stretch in the middle and no stretch at the ends, apply the tape on an angle over the first piece to create an "X". Take a full length piece of tape (10 inches) and tear the backing off one end, anchoring it right below the "X" with no stretch. Apply the tape down over your point of pain with 80% stretch, bending it towards your thigh. Take a full length piece of tape (10 inches) and tear the backing in the middle, peeling it away so you're holding onto the two anchor ends. Apply the tape just below the bottom of your kneecap using 100% stretch in the middle. Bend your knee up and lay down the ends of the tape on either side of your kneecap with no stretch. Using no stretch, anchor the tape on the outside of your knee, about 2-3 inches above the point of pain. Using 100% stretch, pull the tape down over your point of pain. Put the back of your knee on stretch. Anchor the tape just below one side of the back of your knee with no stretch. Peel off the rest of the backing and apply the tape up the back of your leg with 50% stretch. Anchor the tape just below the back of your knee, on the opposite side, with no stretch. Take a full length piece of tape (10 inches) and make 4 cuts down the length of the tape, 1/4 from the bottom. Tear the backing off the un-cut end and anchor it about 4 inches below your Baker's Cyst, using no stretch. Peel the backing off the two outer strips. Apply the two outer strips up the back of your thigh using 50% stretch. Peel the backing off the two inner strips. Apply the two inner strips around (but not touching) your Baker's Cyst, using 50% stretch. Bend your knee to 90°. Take a full length piece of tape (10 inches) and cut it in half, rounding the corners, so you have two pieces that are each about 5 inches long. Take one of the 5 inch pieces of tape and tear the backing in the middle, peeling it away so you are holding onto the two anchor ends. 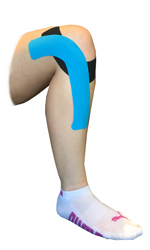 Using 80% stretch in the middle, apply the tape diagonally over the point of pain on your knee. Using 80% stretch in the middle, apply the tape diagonally over your point of pain to create an "X" with the first piece of tape you applied. 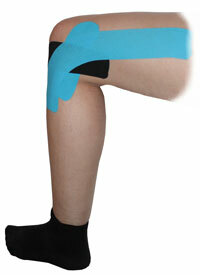 Using 75% stretch in the middle, apply the tape horizontally over the point of pain on your knee. Using 80% stretch in the middle, apply the tape just below but overlapping with the first piece you applied, to ensure the entire painful area is covered. Anchor the tape to the outside portion of the back of your knee using no stretch. Using 50% stretch, apply the tape diagonally across the back of your knee and down to your upper calf area, making sure the tape is covering the painful area. Anchor the tape to the back of your thigh, on the inside portion of your leg, using no stretch. Using 50% stretch, apply the tape diagonally across the back of your knee and down to your upper calf area. Take another full length piece of tape and anchor it to the back of your thigh, on the outside portion of your leg, using no stretch. Using 50% stretch, apply the tape diagonally across the back of your knee and down to your upper calf area, creating an "X" with the first piece you applied.